If you live in The Woodlands area you may have heard the name Bruce Tough, but why? Who is he? Bruce Coulson Tough, Attorney at Law, is the Founder and Managing Shareholder of Tough Law Firm in The Woodlands, Texas. But founding a law firm in The Woodlands is not all he's known for. 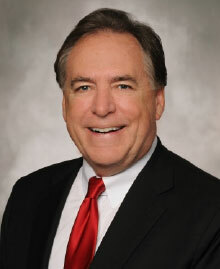 In fact, Bruce and his family have been involved in The Woodlands community for decades. Bruce's Father, Coulson Tough, is an architect who teamed up with George Mitchell (and others) to plan and create the master planned community of The Woodlands some 40+ years ago. Bruce himself officially moved to The Woodlands in 1996 after earning his law degree from the University of Houston. Bruce first became involved in the community by becoming elected as a Director on the Woodlands Community Association (WCA), the forerunner of the current Woodlands Township. He held that position on the WCA from 1999 to 2010, holding the position as President from 2000 – 2004. He was also the Chairman of The Woodlands Community Service Corporation which provided city type services to all of the residents of The Woodlands. The Woodlands Fire Department elected Bruce Tough as their President in 2000 – 2004 and 2006 – 2011, during which time the department increased its Public Protection Class rating (commonly referred to as an ISO rating) from an ISO Four to an ISO Two. The department also built a state of the art training facility to meet the preparedness and development needs of regional entities in the area of emergency management and response. In 2003, Bruce Tough was elected as a Trustee on the Conroe Independent School District and served in that position until 2008. Also in 2008, Tough was elected for the position of Director on the Board of Directors of the newly formed governmental entity, The Woodlands Township. He was the public face of the township for years, serving as Chairman on the Board from 2010 - 2015. Tough has served as a Director and Chairman of the South Montgomery County/The Woodlands Chamber of Commerce, Chairman of the annual Economic Outlook Conference, Chairman of the Boy Scouts of America George Strake District and the newly formed Tall Timbers District, as well as many other civic activities in The Woodlands and Montgomery County. Bruce Tough still resides in The Woodlands with his wife Diana, and four daughters, Madison, Tara, Abby and Sydney.